Just watch an attachment screenshot. Pages of some free applications looks like as pages of paid applications, but with zero price. Specification updated. <https://wiki.ubuntu.com/SoftwareCenter?action=diff&rev2=623&rev1=622> "If the item is not installed nor queued for installation, the price of the item (e.g. 'Free') at the leading end, and a button at the trailing end: 'Buy…' if installation requires sign-in and payment, 'Install…' if it requires sign-in only, or 'Install' if it requires neither." I don't think varying "Install" to "Install…" is worth breaking string freeze for Pangolin. the code review comments from kiwinote for the additional issues that needs fixing before this can land. Is this work still on schedule to land in 12.04.1? Who's working on it? (please assign the bug to whoever is supposed to work on it). This also affects application lens, as some apps display 'Buy Free' button in the preview in the dash, because software-center-dbus GetAppDetails() call returns price = "Free" and raw_price = "0.00". For consistency with other commercial apps, price in the app details data should say "US$ 0.00" (i.e. should be a formatted price) for those apps. Pawel, I disagree. I think it makes more sense to have the free apps simply be listed as "Free" then as $0. This is pretty standard convention in other app distribution models. However, they shouldn't say, "Buy Free" because that just doesn't make sense. @cassidyjames you and @stolowski have valid points. I think there needs to be delineation of "free to access" apps vs "go thru buy process" apps. For instance, apps in the "paid applications/commercial" status do require one to go through the buy process to validate a subscription whereas other apps that are not "commercial" do not. So technically "commercial" apps are not "free", but they are $0.00 requiring one to go through the purchase process which is simply a login to the pay system for validation. The "Nitro" app shows "Free" and there's a "Buy..." button that takes me to sign in the payment service. So I kinda did a $0.00 purchase. Why was that and is that expected behavior? IMHO not the best UX and quite confusing even for a power user. Well, in non-english, there is yet another related issue, the ambiguity free/gratis does not nessessrly exist, the current situation probably enforces this ambiguity on other languages! I think a 0.00$ is ok; or Gratis. @radko-dinev that is expected behavior. 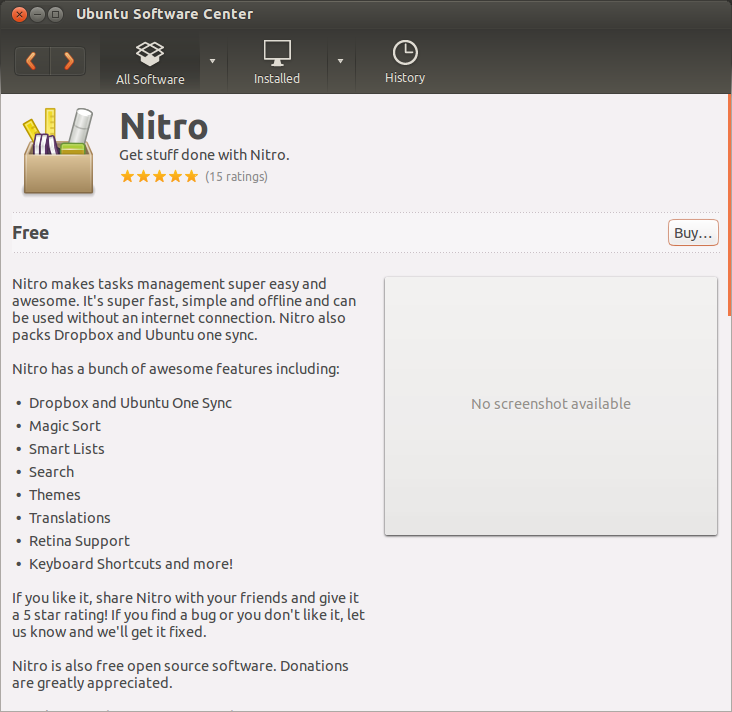 Nitro is a $0 app that is a proprietary license. It requires a $0 subscription hence the need to authenticate the access to the app. @jpugh My point is you don't buy free things so the "Buy..." caption is misleading in conjunction with "Free". The Software Centre should be context-sensitive, so when you're looking at an app where price == 0.00, the option is to 'Install' with the price text shown as 'Free', and if price > 0.00, the option is to 'Buy', with the price text will be shown as the price. @jpugh Login to verify "subscription" on a free "commercial" app does not make sense. It is also poorly aligned with the general F/OSS policy. If this behaviour is something forced on Canonical by the commercial companies behind these applications, then this should be clarified to the user, as to not appear as a forced recruitment for Ubuntu One. I don't expect to have to accept additional terms of services, and create and login to an account to install FREE/GRATIS software on a F/OSS operating system. I hope the bug here is just the misplacing of the buy-button and the forced login that comes with it. If not, then we are done, Ubuntu. Then we are done. I think the whole software center should make more clear the distinction between Free Software (as in free speech), Free software (as in free beer, freeware) and commercial software with a price. And when installing freeware software that requires sign on, it should alert that is just for "subscription" need, you're not paying anything. I remember, when installing Steam, I was kind of scared: I had to press a Buy button, even if the price was 0, and then sign in to my launchpad account without a help/explanation/apparent motive. This is not fixed in Ubuntu 12.04 and Gigalomania (as original bug-reporter said). The source code of this game is freely available - so it's Free (as in freedom, not money) Software, licensed under GPL v2. 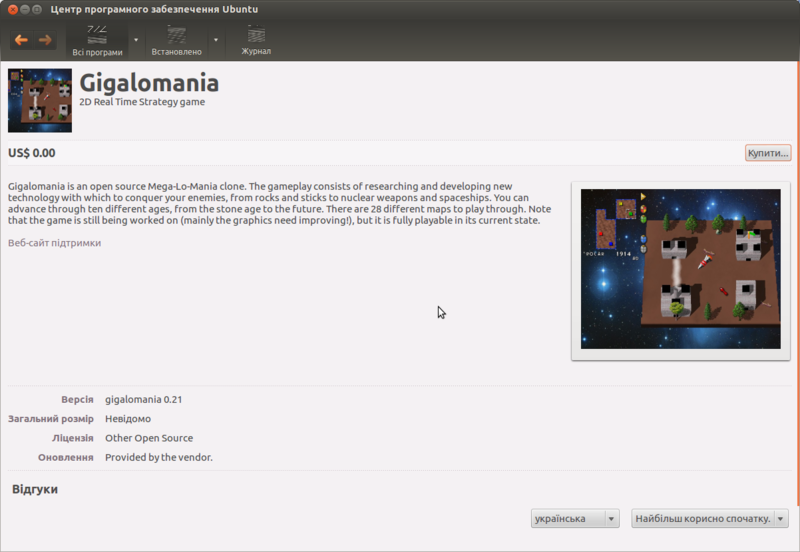 I can confirm all the content of Gigalomania is under a libre license, as said in http://homepage.ntlworld.com/mark.harman/comp_gigalomania.html. as usual, ubuntu doesn't have enough developers to keep up with 18 month old UX bugs, and the debian core remains usable while the ubuntu user experience looks well intentioned but unmaintained :/ not complaining, just lamenting- I have neither the time nor the experience to contribute more to ubuntu, and I don't expect others to pick up the slack. just making an observation that ubuntu's most polished features tend to appear as if they are perpetual alpha-builds. @overprescribed: "… the software catalog … should be a bastion and showcase for apps that are free in both regards…"
There is no "should" in this regard. Remember that the target user for Ubuntu (which includes myself) doesn't give a hoot about libre vs. licensed. We only care that the products are cheap and that they work without malware. If Ubuntu starts making a noise about libre vs. licensed, it will simply put off many LInux converts. Hi i think i found the bug but i need some help building software-center. @Haikal: Thanks for your interesst in looking into this issue! > @Haikal: Thanks for your interesst in looking into this issue! > duplicate bug report (1258565). > looks like as pages of paid applications, but with zero price. Ubuntu Software Center: Why is a 'Buy' button shown if a 'product' costs 0.00?